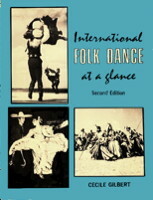 Information: Cecil F. Gilbert, author of books about folk dance. A Guide for Students Preparing to Teach Folk Dancing. Gilbert, Cecile F.. Ph.D. dissertation, State University of Iowa, 1949.
International Folk Dance at a Glance. Gilbert, Cecile F. Minneapolis: Burgess,1969. 2nd ed. 1974. (GV 1743 G5 FAL).